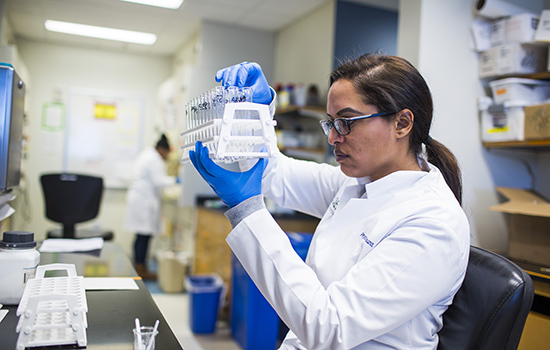 Program associate Priya D'Souza (public health) analyzes environmental samples. The Woodruff Health Sciences Center invested a total of $125 million in research costs unrecovered from sponsors in fiscal year 2016-2017. Researchers in the Woodruff Health Sciences Center (WHSC) were awarded more than $584 million in research grants from the NIH and other organizations in fiscal year 2016-2017. This includes funds accompanying designation of Winship Cancer Institute as a comprehensive cancer center by the National Cancer Institute, placing Winship in the top 1% of all cancer centers in the country. It includes grants to renew funding for existing major centers—Emory's Center for AIDS Research, the HERCULES Exposome Research Center (studying environmental exposures and biological effects on health over the course of a lifetime), the Atlanta Clinical and Translational Science Institute (now renamed the Georgia Clinical and Translational Science Alliance), and NIH re-designation of the Marcus Autism Center as a center of excellence. It also includes funds to expand the National Ebola Training and Education Center and funds to investigate improved post-transplant drug regimens, using a class of drugs discovered at Emory. Research grants and contracts such as these benefit the community at large through new understanding of disease, new treatments, and creation of literally thousands of jobs. But doing research requires considerable co-investment from institutions like Emory, which cover many infrastructure costs for facilities, maintenance, and administration of the research enterprise. Last year, for example, the WHSC invested $125 million in research-support costs unrecovered from sponsors.